Experience the new dance fitness sensation with husband and wife team Billy Blanks Jr. and Sharon Catherine Blanks. They will take you through three complete dance routines showing you how to shake it and burn mega fat - African, Disco and Latin style. 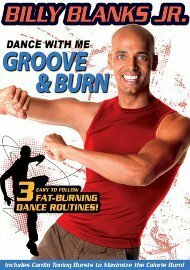 The Dance With Me home DVD system combines easy to follow dance routines with 2- minute toning bursts to help you build stamina and burn up to double the calories. This workout is specifically designed for all ages, shapes and sizes.